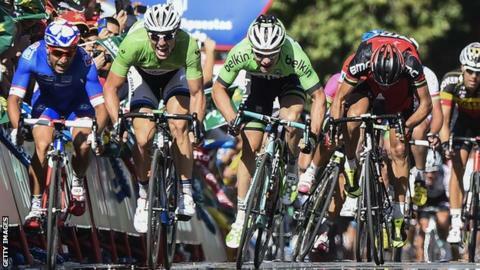 Germany's John Degenkolb won his second successive stage of the Vuelta a Espana after a controversial finish. Degenkolb, who won the previous day's fourth stage, edged out France's Nacer Bouhanni, who claimed he was blocked off trying to pass on the finish line. Bouhanni had to settle for second in the 180km stage while the Netherlands' Moreno Hofland finished third. Australia's Michael Matthews extended his overall lead to 13 seconds over favourite Nairo Quintana of Colombia. Quintana finished five seconds back on the stage from Priego de Cordoba to Ronda. He was alongside Spanish duo Alejandro Valverde and Alberto Contador and 2013 Tour de France winner Chris Froome after a slight split in the peloton at the finish saw them all lose a handful of seconds on the leader. Froome is 38 seconds back overall, having picked up a couple off Quintana when some quick thinking saw him burst out of the pack to nab some bonus time on the day's intermediate sprint. He has moved up two places in the general classification to 13th. 1. John Degenkolb (Ger/Giant) 4:04:21"
1. Michael Matthews (Aus/Orica) 17:35:05"
2. Nairo Quintana (Col/Movistar) +13"
3. Alejandro Valverde (Spa/Movistar) +20"
4. Rigoberto Uran (Col/Omega Pharma - Quick-Step) +24"
5. Damiano Caruso (Ita/Cannondale) +26"
7. Haimar Zubeldia (Spa/Trek) +29"
8. Wilco Kelderman (NL/Belkin) +32"
13. Chris Froome (GB/Team Sky) +38"